Hacked DNC File: Fears over Hidden Clinton Foundation Donations from Former Russian Uranium Exec. On Tuesday, hacked Democratic National Committee (DNC) files released by the Guccifer 2.0 hacker reveal circulated talking points intended to combat the Clinton Cash revelation that the former head of the Russian uranium company UraniumOne, Ian Telfer, made four undisclosed Clinton Foundation donations totaling $2.35 million—a clear violation of Hillary Clinton’s ethics agreement with the Obama administration to disclose all donations. This is hardly an effort on the Foundation’s part to avoid transparency. In fact, the main donor noted in the Post article as contributing to CGEP (Canada) — Canadian businessman Ian Telfer — was also disclosed as a Foundation donor. So the fact of his status as a Foundation contributor was not at all a secret. However, as Clinton Cash reported, and the New York Times reported in a 4,000-word, front-page investigative report, the former Russian uranium executive’s donations were not disclosed. “Those contributions were not publicly disclosed by the Clintons, despite an agreement Mrs. Clinton had struck with the Obama White House to publicly identify all donors,” reported the Times. 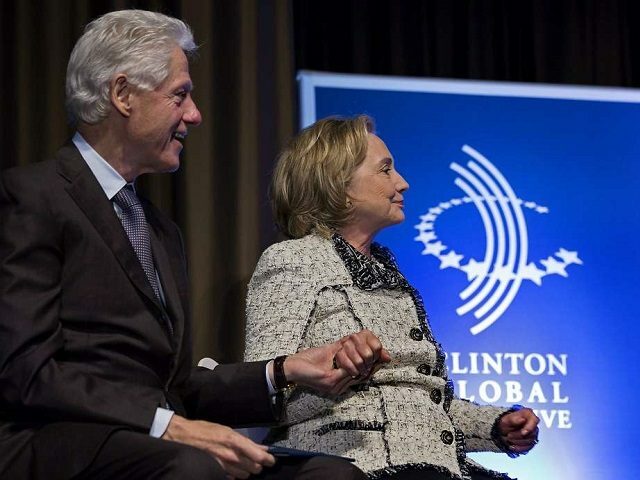 The hidden $2.35 million in Clinton Foundation donations from the former Russian uranium chief were part of a larger $145 million given from nine uranium investors involved in the deal approved by Hillary Clinton to transfer 20% of all U.S. uranium to the Russian government. To date, Hillary Clinton has not received a single question from a national journalist about her decision to transfer 20% of all U.S. uranium to Putin’s Russia as nine investors in the deal funneled $145 million to her family foundation.